This Monin .25 oz. syrup pump makes it easy to dispense flavoring syrup for your flavored coffees, frappes, Italian sodas, and mixed drinks! 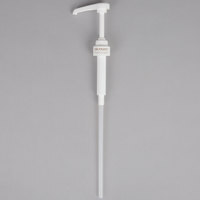 This plastic sauce pump fits Monin 750 mL glass flavoring syrup bottles and dispenses .25 oz. of syrup with each pump. It will dispense a consistent amount of flavoring syrup in each beverage cup, making it easier to control portioning and ultimately save costs. Make sure you have the Monin bottles for this pump. It does not fit the other 750ml bottles. They will still work but not twist on and seal. I took them to an event and the snocone flavors I had put in DaVincci bottles worked but did not screw on. This pump has solved a problem for me, in that my other pumps did not fit on the Monin glass syrup bottles. The measurement is really accurate, which allows the formulas to be written in # of pumps. this pump works perfectly with the moning syrup glass bottle . it helps our staff makes the specialty drinks faster and more accurate just by pumping the syrup instead of pouring it down. Does the job but they aren’t kidding when they say it only fits the Monin syrup bottles! I’m a bit irked that I need multiple pumps because I occasionally switch between syrup brands, but whatcha gonna do? Is it syrup pumps are perfect for the Monin premium gourmet flavorings. They are interchangeable and easy to wash. They pump well and smoothly. Perfect! They're easy to clean. I use them for all my Monin brand syrups at my coffee shop. They only work on the glass Monin bottle; I have a couple flavors that are in plastic 33 fl oz bottles, and they take the other .25oz syrup pump available on Webstaurant. Fits perfectly on our flavored syrup bottles and is a guaranteed way to create consistency with the measured pump. They hold up very well to failrly heavy use. These pumps are perfect! They give us an accurate amount of syrup and take out the guess work. At the price point they are very effective. We like to keep several extra on hand just in case we need them. These work great for Monin syrups, but aren't universal for other bottles-- oops! I have a few extra that I can't use until I buy more Monin brand syrups. We use the syrup at home and when we host clients, so we don't go through bottles like a coffee shop would. This syrup pump is great as long as you're using it with a Monin syrup bottle. It will not fit all sizes of bottles that come with other brands, but it is easy to clean and use. It needs a good wash every now and then to clear it out, as can be expected with any syrup pumps, but then it is as good as new. These are a must-have if you use any of the Monin 750ml syrups. They are easy to clean with just hot water and they dispense a consistent quarter ounce every time. I love this .25 oz Pump for all my syrups. it fits perfectly on all my Monin Syrup bottles. So glad Webstaurant have them all for us. I wish all syrup pumps worked for every brand, but these work great for Monin. We had no problems with all the pumps I purchased and we love all the flavors we use! This is the .25 ounce Monin pumped up. It is very useful in distribution of flavors for both coffees and Italian sodas. Definitely recommended with the Monin see reps pretty much a necessity . These work well for monin syrups.. I do wish they would last a little longer than they do. But they are a plastic product so they wont last forever. This works well and makes it loads easier to make drinks without all the sticky sugar. It doesn't fit on Torani bottles, though, but that just means I'll need to order the real stuff! Easy to use.Pump tube length works wonderfully .I highly recommended this pump.I used on monin 750 glass bottle and fits perfectly.I always mesured the same amount.low price high quality!! A great addition to the purchase of the monin's and highly recommended if you are using their bottles. Other pumps do not fit the glass opening. Purchased a few of these for out selection of syrups. This syrup pump works great for thinner liquids and syrups. It's long enough so the waste in the bottle is minimized. Well crafted and a great companion to the Monin syrups. Nice pump to use with the monin flavor syrups. They fit perfect and provide a measured amount with each push. Price was not bad for something that is definitely needed. Works great but not universal! I have Torani syrup bottles and they don’t fit at all. Luckily I was able to work out a solution to get them on the bottles by gluing the bottle’s original los inside the neck of the pump but what a pain! My fault for not checking but still annoying. Best price on the internet! I can't even get them this cheap through my wholesale account with Monin. I just wish webstaurant carried the pumps for plastic monin bottles as well! Durable and easy pump to use when dispensing Monin syrups in our customers coffees. Clean up is a breeze would highly recommend using these. Great product! the perfect portions for our flavored drinks. The .25oz lets you customize how much flavor to put into different sized drinks depending on the flavor. Nothing fancy, but it gets the job done. Cheap, but essential addition to make sure your drinks get consistent flavoring without any guesswork. Looks professional and is easy to use. This pump works great for monin syrup bottles. They may not work for other syrup bottles. This allows for a small amount of syrup at a time. Fits perfectly on the Monin flavoring syrup bottles and makes it easy to measure the syrup added to each drink cup. Very easy to pump. Monin .25 oz. Syrup Pump #544P230 absolute must for the monin syrups. easily cleaned. perfect dispensing amount. rarely have to order because they are sturdy. We bought this pump to use with our Monin pistachio syrup that we use in our coffee shop. It works great and does the job it is supposed to do. The monin .25oz syrup pump works nicely with the glass 750ml syrup bottles. Easy to use putting on and off and it dispenses just the right amount during vending events. Well put together and durable for several uses. These pumps fit the Monin syrups perfectly, are easy to clean and always dispense an even amount of syrup. We love using them with the vanilla and caramel syrups. I couldn't find these in any stores....what a life saver! I was able to get pumps for all of my Monin syrups....now I don't have to hand measure them as much. They pumo makes it SO much easier to measure the amount of syrup we use in our drinks. It perfectly fits the Monin bottles and lends a professional look. Good sturdy pump that is easy to use and easy to clean. They are a definate must have for your Monin syrups. It meters out the product and helps in staying cost effective rather than trying to free pour irregular amounts. Also note that the Monin pumps are for the Monin syrups only. They do not fit the other bottles right and the other pumps don't fit Monin bottles right. These pumps work great with Monin syrup. They pump the perfect amount and are very sturdy. We have bought at least a dozen and they have all worked great. If you use Monin syrups, these pumps are necessary to buy as they are not included when purchasing bottles of syrup. They are easy to clean and screw and unscrew easily. Great pumps the cover that hose over the tip works good at keeping the syurps from drying up in the end. Very good quality product for at home or at a business! Simple pumps that get the job done. They fit nicely on Monin 750ML syrups and stay on! They do tend to get clogged here and there, but nothing some hot water won't fix. Syrup pumps are very useful and avoid messes. Not only does it prevented from the area to be messy, it takes out suitable amounts for the drinks. These pumps make adding syrup for individual servings really easy. I checked the amount with my digital scale after pumping into a mug and it was pretty accurate. Of course depending on the force you use it will fluctuate, but having weighed it, I know what to do. Monin pumps are great. I purchased mine for the Chai Tea concentrate and the dispensing was spot on. It is a very smooth action pump. These work perfectly with Monin syrup bottles! They work smoothly and they're nice to be able to measure out the amount of syrup you're adding to the your drink. For the look and price, they're a great deal! Durable so far. Easy to clean. Fit most bottles (didn't fit the 1 liter bottle). Glad to use it to measure out syrups precisely in drinks. Love these Monin syrup pumps. Makes is so handy to just pump exactly what you need in just a few pumps. Price is extremely reasonable. Does exactly what it is meant for. Use in Monin syrup bottles or other similar product line should probably work okay too. Use in 750 ml bottles. This pump fits? perfectly with my Monin syrup bottles. The prices for these pumps are great and highly recommend to other cafe owners or customers that make flavoring coffee. I like keeping these syrup pump on all my different flavored syrups. They are just so handy and give you the exact amount every time. Finally I found the right pump to fit my Monin syrup bottles. I had been using Torani pumps that don't screw on and they make a mess. These are a great price and fit snugly on my Monin bottles. These pumps are great. They are priced really affordable. My favorit part about them is that they come with covers for te nozzle. Great for keep product safe. Pump does not work with DaVinci or Torani 750 ml bottles. Otherwise pump appears to be great quality. I would be very pleased if it had fit the bottles I have. If you have the Monin .25 bottles I would recommend this pump. I got the whole line of monin syrups for my house and these pumps make sodas a breeze. Use them for a variety of drinks! These pumps are perfect for making the addition of syrup to any hot or iced beverage easy and quick! We use the pumps in all of our syrups and they are sturdy enough to handle busy mornings! This pump arrived quickly and on time. It was packaged nearly and functioned as described. Small rubber stoppers were included to keep the tips clean. Pumps look nice with white label monin strips. Very convenient way to ensure consistent flavor & sweetness levels. Fits perfectly in my 750ml glass bottle. Not that I've seen any drips so far, but the rubber cap will catch any that do form. The issue of overflow when installing pumps in a new syrup bottle is easily fixed. Hold the pump in your hand in the down (post-pump) position. Then insert the straw into the syrup, slowly releasing the top. The syrup will be sucked into the pump, preventing waste/spillage and reducing the number of partial pumps at the beginning of the bottle. Pretty basic pump that fits the monin bottle perfectly and dispenses the product as it should. Inexpensive product but it is good for what it is. You can't get these pumps for this price ANYWHERE. Great quality product from Monin, and at less than half the price I've seen through any other retailer. They were shipped quickly and have worked great, dispensing 1/4oz consistently. A simple weekly wash keeps these lasting years! These tend to leak just a little, but I just put a rubber bar mat in front of the bottles and problem solved (just run it through the dishwasher at EOD). Using a step jigger these accurately dispense .25 oz. This pump perfectly fits with monin syrups. But it is drying in a while and I need to take it off and wash with boiled water to open again. Keep it open for good result. These work great with the Monin glass 750 bottles. The straw part has to be put on the pump because they unattached to fit the packaging. It isn't though difficult to attach. A little came out of the bottles while putting these on but because they were brand new and very full bottles. These also came with the black stopper to cover the open part of the pump while not in use. One pump is one fourth of a serving size which is actually the perfect serving size itself. These make it easy to use the syrups, get an even amount each time, and look good while on the bottles. These pumps are great for our Monin syrups. I highly suggest that you clean the pumps regularly and put the caps on the end when not in use. Otherwise the syrup clogs the pump. We soak ours in hot water and it cleans them right up! These pumps work great for glass monin bottles only. We tried them on other brands and on plastic bottles from GFS and they will not screw on. Perfect companion for Monin Syrup bottles. Be warned: these don't work with DaVinci syrup bottles even though they're the same size bottles. Sometimes the syrup may dry out and stick to the opening of the spigot, but you can just scratch it off and it will work perfectly well again. The description specifically states that it fits Monin brand syrups. It does not fit. it is the same as the pumps for Torani or Davinci. Thankfully I can use it in one of those bottles but I am disappointed because we purchased a few Monin flavors and won't be able to use the pumps for them. We appreciate your feedback! We’re sorry you received the incorrect pump size. A Customer Solutions Representative is working on getting you the correct product. Perfect compliment and must have for the Monin 750ml bottled syrups. Very easy to use and clean. It pumps with ease and is very durable. *WARNING* this is for Monin bottle use only, it dispenses nicely, and works well. The Monin label makes it look much better than plain white with no graphics. I think for the money this is the best syrup pump I have ever bought, I measured out shots and every time its on the money and each pump is .25 oz with makes it easy to use and when done you can lock the plunger to keep your syrup fresh and even comes with a cap to go on the nozzle, It has the Monin logo on the base of the pump and when I display them customers are impressed and makes them buy more from me, Visual is everything and with the Monin pump you get the best of both worlds. These pumps work absolutely fine for the purpose intended. The pumps do not leak and I like the rubber tips that close the ends. The only problem ...they ONLY fit the 750 ml glass bottles. I love these pumps. Before I bought these I was using a bartender metal pour spout and it was causing me to over/under pour! This product saves me time and money, because we know exactly what we are getting in each drink and makes consistent drinks each time! Thanks Websturant! These pumps worked nicely for our Italian soda bar at our after-rehearsal dinner. Kids and adults loved making their own and mixing flavors. I took off one star because the pumps are a pain to disassemble and clean, and while they come with little black caps those didn't seem good for transportation or longer-term storage. If you use up a bottle or plan to keep the pumps attached, I see no problem with them. If you are ordering Monin syrups, this is an absolute must. I've used Torani Syrups in the past and their pumps don't seem as sturdy as these. They are well made and fit perfectly into their syrup bottles. Make sure to "open" the pump first to avoid any spillage in new syrup bottles. For easy cleaning, I use hot soapy water and run it throw the pump a few times to clean everything out then just hot water. Very easy to maintain. Fantastic pump! Clean spout, consistent amount is pumped every time, and the nozzle cover is great so the syrup never dries out or causes clogs. These are perfect for the glass monin 750 ml syrup bottles. They are airtight and are easy to put on. The included spout covers are great in keep syrups from dripping. Do use up some of the syrup before putting these on or the bottles overflow due to displacement. Excellent handy syrup pumps. They were so perfectly and I have never had a problem with them yet. These look super nice sitting on the monin syrups. These pumps are simple to use and to clean as well. I've found that in the summertime, some of the Monin syrups - like vanilla and hazelnut - can build up on the end of the pump and harden, which causes the pump to clog. This is easily remedied by tossing the pump in a clean sink full of hot water and letting it sit for several minutes. The sugars dissolve and the pump works perfectly again. Just the pump I needed for my beautiful Monin syrup. I enjoy my syrup daily so the pump is essential. it serves just the right amount and fits great on the bottle. A must have when ordering the monin flavoring or syrup. It screws on the top of the bottle and then in just takes a few pumps to create a delicious drink. This product is perfect for my business needs. These pumps fit perfectly on the Monin syrups and look great. I just wish the logo lined up straight on the bottle. Pump works great and fit my Monin Syrup bottle without a problem. Release the pump before inserting it into the bottle or the syrup will overflow. I have to say I was kind of scared to order online but all was in perfect condition and came on time. Great pump. Makes our baristas jobs a lot easier using these pumps instead of pouring out syrups into small measuring cups to make drinks and shakes. These Monin syrup pumps are great. They are good quality and work well in our busy cafe. They are easy to screw on and off sticky bottles of syrup. Great buy. I added these to an order without reading the full description....lesson learned....they do not fit the plastic Monin syrup bottles that I have on hand. They still worked great to pump the syrup even though I couldn't screw them on. These work great on the Monin brand bottles. I haven't tried them on other brands, but I know the other brands don't fit on Monin bottles. Easy to use. Easy to clean. A must have for all of your Monin syrups. I like to keep a bunch extra on hand to swap them out so they can soak overnight. Monin .25 oz. Syrup Pump works for the Monin coffee syrups. I love the little cap that comes with this pump. I hope to find them for the other brands. I thought this would work in my other top name syrup bottle but it did not fit. It appears to be made of a mid grade plastic. These Monin pumps work well with any syrup bottles. It doesn't leak or doesn't pump out air. It pumps out consistent amount of syrup every time.